It is with this crop that we have a lot of satisfied customers at HORTOMALLAS. 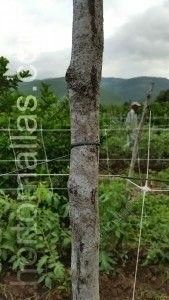 In order to raise cucumbers on a vertical trellis their natural ability is utilized due to the fact that this cucurbitaceae is a climbing plant whose tendrils grab ahold of the trellis netting which then serves as support for the plant to extend itself vertically. The vertical growth of cucurbitaceae is essential for plant health since by being able to extend vertically, better circulation of air is permitted through the foliage of the plant and infestations by pathogens from moist conditions are reduced by more exposure to sunlight. 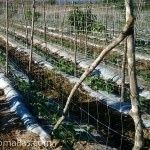 One can appreciate the difference between vertical trellises made by using twine and those made of trellis netting. 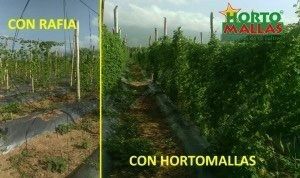 With HORTOMALLAS one guarantees the plant the optimum in a vegetable support system. 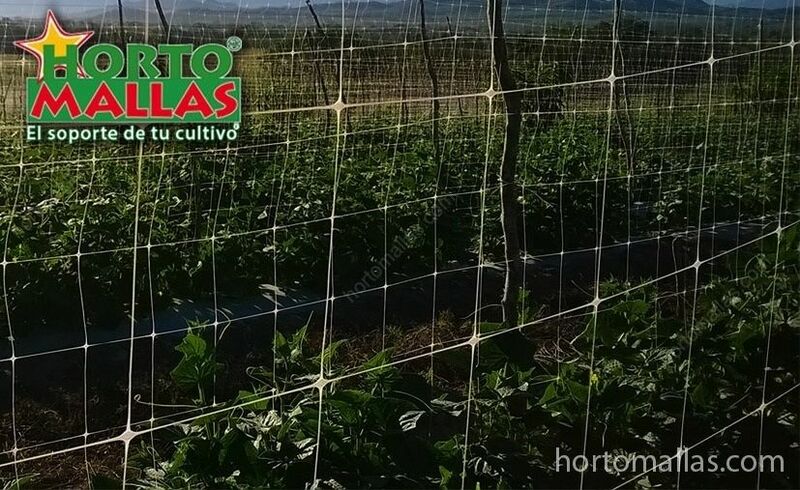 The cucumber plant progresses in its vertical growth with the help of HORTOMALLAS cucumber trellis netting. When the crop is raised on the ground, the plant runs the risk of getting damaged by the grower while checking on the progress of growth, whereas with the HORTOMALLAS cucumber trellis workers in the plot are not going to damage the crop. Let’s remember that each “wound” on the plant is a point of infection. Cucumbers should be pruned while the plants are young. For this reason when one is going to grow cucumbers on a trellis the plant is easier to care for because it makes it easier to cut off lateral foliage, leaving only vertical foliage which favors the lateral branches growing advantageously by fastening to the trellis netting and encouraging the production of blossoms. If we increase the cucumber plant’s blossoms, we will benefit pollination of the plant, contribute to the development of fruit, and ensure a good harvest at the end of the crop cycle. Growth of the cucumber is essential for the producer, since from its uniformity he will generate the cash flow that is expected from growing this vegetable. 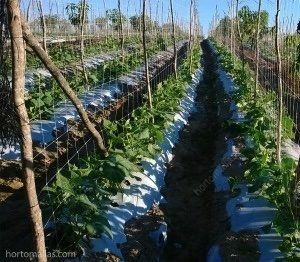 HORTOMALLAS in 25x25cm (10 X 10 inch) squares for cucurbitaceae or solanaceae is the best technical option as an alternative to twine. The large openings permit a person to work both sides of the row from one side without needing to move to the other side and without damaging the plant when pruning and harvesting. Growing cucumbers on a cucumber trellis favors uniformity in the development of the fruit because it gives it space, aeration, support, and it prevents the arrival of pathogens and diseases that infuse themselves into its entire physiological process by reducing the formation of moisture. It is on this process that the success of the production of the crop depends as well its quality and that makes it all worthwhile. EThis is a close-up of how to tie the trellis netting to the post. It’s the same procedure for cucumber plants. The cucumber is an important cucurbitaceae in the national market as well as the international market due to the high rate of consumer interest because of its culinary as well as its industrial aspect. For this reason it is recommended to grow cucumbers on HORTOMALLAS cucumber trellis netting (growing cucumbers) as well as other members of the cucurbitaceae family such as pumpkins, watermelon, and cantaloupe, which are plants that are suitable for growing to maturity with this method that actually strengthens their development. If we push for and promote this method in the agricultural sector it would be of benefit to the productivity quality of this sector. We as technicians and ag professionals should begin to apply the use of new technology for the good of the farming community, giving rise to greater profitability. This is accomplished through the use of trellis netting since it can be reused for three or four crops and thus we avoid producing waste that contaminates the soil and we lower the expenditure side of the ledger by not needing to buy a ton of natural fiber twine per hectare (2.5 acres) for every production cycle. This netting is also known as cucumber trellis. 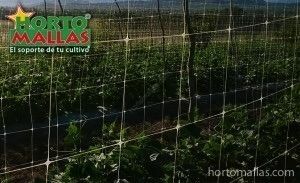 Raising cucumbers on a HORTOMALLAS vertical trellis is highly profitable. Do you want to see more images of Cucumber Trellis?